As far back as the Roman Empire, people have been building arbors from bent twigs, branches and other vegetation. Look for pliable twigs to make your arbor, as they bend better without cracking and breaking. Thicker branches that are straight are used to create the side supports for the arbor. This project can be made in a day or two, depending on whether you have the materials readily available. Supplies for the arbor may be found in your backyard or other wooded area as well as home improvement, hardware and craft stores. 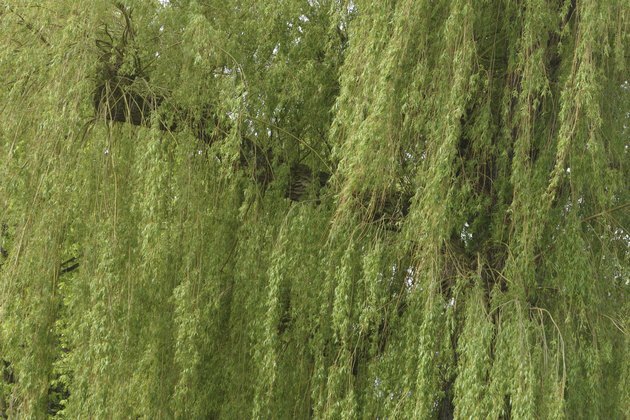 Willow tree branches are thin and pliable. Collect the twigs and branches for your arbor. Gather long, pliable pieces of tree branches, including some thicker ones. Look for willow, mulberry and birch trees for your twigs, as these types of trees generally have thin and pliable branches. Cut the twigs from the trees with the pruners where they join the trees. Hammer the rebar into the ground. Hammer the first piece 2 feet into the ground. Then hammer a second piece 4 feet from the first one, also 2 feet into the ground. The remaining two sections of rebar are parallel to the first set, with 16 inches between the first and second sets. If you are placing the arbor over a walkway, for example, you would have two pieces of rebar on either side of the walkway. Make four twig bundles. Each bundle is 16 feet long and attached to a piece of rebar. To make the bundles, start with two or three of the larger straight twigs. Tie these together with the bailing wire. These are the backbone of each bundle. Add more twigs, securing them to the first bunch. To get the height required, place more twigs partway up the stems of the first ones and secure with bailing wire. Attach the bundles to the rebar sections with more bailing wire. Start forming an arch with the upper sections of bundles on the right and left. The arch should be at least 7 feet tall for people to comfortably walk under it. Use the ladder to be able to reach the branches to tie them together at the desired height. Keep binding branches together until the arch is completely formed. Tuck in any of the lower twigs from the bundles and secure them with pieces of wire. It is best to get the arbor looking the way you want it to now, while the branches are still pliable.